Small children often want to learn how to ride a two-wheel bike so they can go out and have fun with their friends. However, they often feel scared about toppling off the bike and getting hurt. This fear makes it difficult for them to learn and, as a result, they end up missing out on the fun times they could have had ridden a bike with their friends… and this is why the KaZam Classic bike exists. Designed without pedals, the KaZAM Bike allows little riders to develop their balance before introducing pedalling, making the transition onto traditional bikes seamless. The purpose of the bike is to teach toddlers how to balance and steer before they are introduced to a pedal bike. The height adjustable handles bars and seat on this KaZam balance bike allow for a wide range of user-specific customization. The handlebars adjust from 18.75 inches to 22.5 inches, and the seat from 14 inches to 17.5 inches. Furthermore, the generous weight restriction allows toddlers who are late for learning or are taller and the opportunity to learn how to steer and balance on a comfortable bike. This pedal-less bicycle is lightweight enough to hook onto a double stroller, or even be carried by the child over short distances. It has no-tool-needed adjustments for both the seat and handlebars that make for quick and easy adjustments to accommodate multiple users or the growing child. This bike was designed to get your toddler comfortable balancing on two wheels. It has a frame-integrated step-in footrest that provides the little rider with an intuitive support where they can rest both feet. It makes it easy for them to right themselves as they only need to shift one or both feet to the side. Moreover, the use of actual rubber, air-inflated tired make it not only look but also feel like a real thing. The KaZam classic balance bike does not have a crossbar they could trip over Parents can expect a lot fewer tumbles from their children riding this balance bike than a conventional pedal bike. Most of the negative reviews that manufacturers of this best balance bike have been getting revolve around the shape of the seat when packaging and manufacturing malfunctions are exempted. The good news is that buyers can expect excellent customer service when they report any problem. The KaZAM Classic Balance Bike comes with a raised molded seat which has mostly flat forward facing angles and a miniature molded backrest. This is a feature that some toddlers, for some reason, do not like. Like most bicycles, you can expect the adjustable seat and handlebars to loosen gradually over time, but they can be easily tightened. 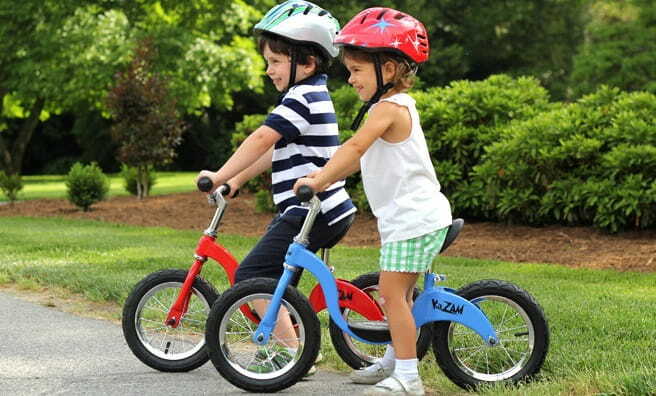 The KaZam Classic Balance bike allows your toddler the joy of zooming along the driveway or lightweight bike trail without the fear of toppling. Its integrated step-in footrest offers children a fantastic way to transition to advanced pedal bikes.